After a classmate was involved in a car accident, a group of students decided to raise awareness of the dangers of using headphones and mobiles when crossing the road. The group, from Coleg Gwent, Crosskeys campus, want to encourage people to listen and be more aware of cars and what’s going on around them. They’ve designed a poster with the slogan Switch off, switch on, stay safe which they hope will save someone from getting hurt. Josh Carter explained: “It’s important to have all your senses when you are outside, you need all your senses for survival, and some people I see when crossing the roads don’t look both ways. The campaign was inspired by student Josh West, 18, who ended up in hospital after being hit by a car. He was not wearing his hearing aids at the time of the accident and hadn’t heard the car coming. Along with Josh’s accident, the group have witnessed people falling over when using their phones and believe the distraction makes them more vulnerable. The group, who are all on a life skills course, hope the poster will make people put away their devices and check it is safe before crossing the road. 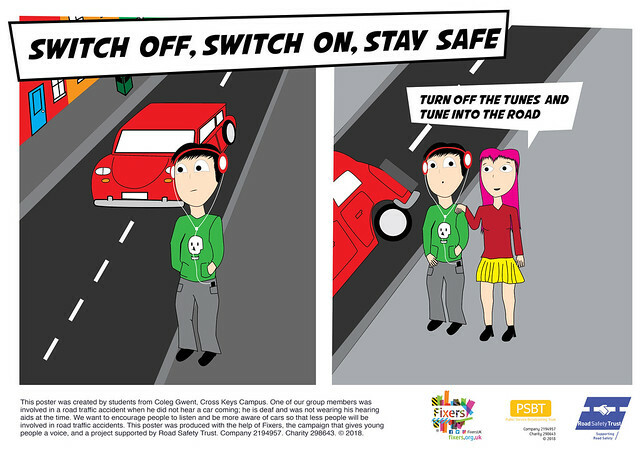 It shows an image of a girl stopping someone wearing headphones from crossing the road with the words ‘turn off the tunes and tune into the road’. They hope to display the poster in local bus stops and around their college. “It’s all about being aware of your surroundings, put your phone away and use it when you get to where you are going,” explained Joe, who is part of the group. Fellow student Zane added: “Mobile phones in particular are a massive issue, people taking selfies when crossing roads, on social media, texting, there are a lot of accidents around here because people aren’t paying attention. This project was funded by the Road Safety Trust.